Jack Daly is AIB’s Docklands Manager responsible for the AIB IFSC and Grand Canal Dock Branch Outlets in the Docklands. Jack is tasked with implementing the vision of a unified approach to the unique requirements and demands that this growing community and workforce on both sides of the Docklands command, with a concentrated dedication to the Mortgage business needs. of the “Most Beautiful Bank of the Future” EFMA Global Banking Distribution Marketing Innovation Award in the category “Physical Distribution”. Awarded Silver Design Award in the category of “Interior Space and Exhibition Design” and finalists with the Retail Excellence awards. Jack is entirely customer-centric and is passionate about and the creation of environments and customer journeys that are conducive to this ideology. Work experience has focused on Customer Experience, Business Development, Strategic planning and implementation, Co-creation and Technological adoption. With an Educational background in Marketing with Event Management, QFA/Diploma in Financial Advice and further qualifications including “Banking in a Digital Age”, “Customer Experience Management” and “UX” User Experience testing with further professional qualifications in progress. 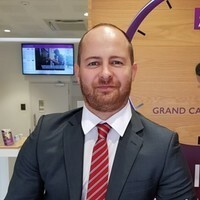 Jack is keen to be a visible and an active member of this vibrant community representing AIB to support our customers Business and Personal needs.